A person should always have dreams to pursue, and this is what Shindou Shuichi believes, since having them brings meaning to life. His dream is to become a successful singer, but what can the rough road to stardom mean for this dreamer? With the support of his friends, family, and with the sudden meeting of famed romance novelist Eiri Yuki, what shouldn't be too difficult for this high school graduate? Bring on the worrying managers, the indulgent yet competitive producers, the ever cute siblings of both leads, and also bring on the fiancés, and that is only a part of this book series. 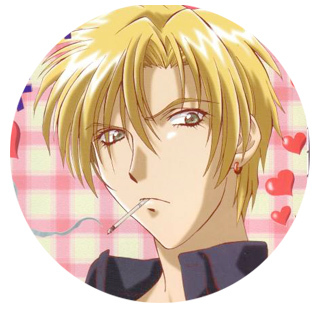 Shuichi fits the mold of a clumsy, lovable, male lead, who always tries his best even while being unsure of himself. 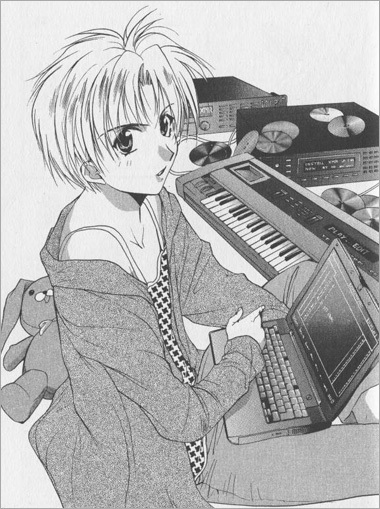 Yuki is the cool and confident appearing, that had the author in tizzy illustrating and bringing out his personality. He is definitely a match to Shuichi's immature personality though. I might be biased as I write this, but there is a type of reader that I definitely would recommend this title for. They should have an open minded approach to the shonen ai theme; enjoy the energy, comedic moments, and perseverance that Shuichi has in pursuing his dreams. 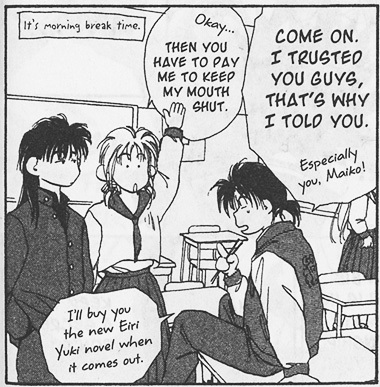 Readers, who are romance fans, should also like the cool guy approach that Yuki radiates. So if you are willing to consider checking out this series, check out Junjou Romantica for another shonen-ai series. 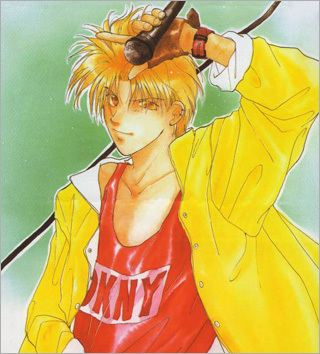 For aspects of a cool male lead to an immature lover, might want to look back on the first season of Sailor Moon or for the ever changing, yet unsure relationship angle, Marmalade Boy should appeal to romantic readers? For the struggle to fulfill a dream, perhaps Princess Tutu, or Kaleido Star should be easy? 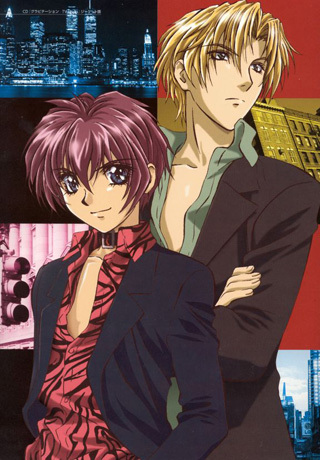 Gravitation has been released for several years already, and had an impact with readers being a fascinating gateway to shonen-ai, or boys love, back when graphic novel was hitting mainstream U.S. My introduction with this title has been from the animation, and reading this title brings back fond memories of the definite upbeat popish techno beat that the 12-episode animation spin-off used. Many Japanese animation fans probably know about this series, or have enjoyed it in the past, but with the trend of the publishing market heading into omnibus formatting. For new fans, collecting this series is made easier and cheaper. 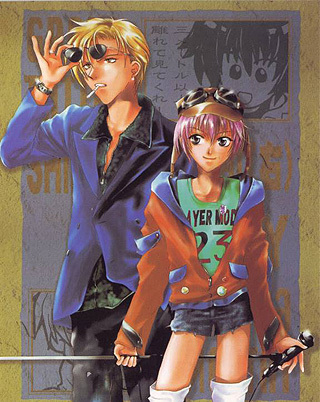 Each omnibus of Gravitation has two volumes in one book. The different between the animation and the graphic novel is subtle, but there is an establishment for more of the back story, which the short anime series has failed to expand upon. 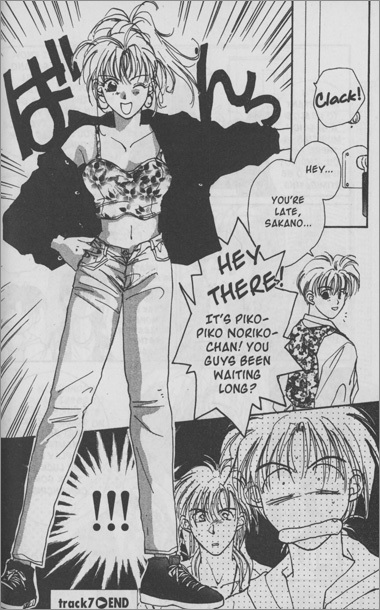 Maki Murakami had visited the U.S. several years ago, and fans back then were lining up to see her exclusive appearance. She was notoriously camera shy, and definitely had moments that showed fans a side to her, that brings to life what her author notes conveys. Gravitation is definitely not a series for all readers, but should bring a spark for readers who fit the mindset for what this series promises to be. 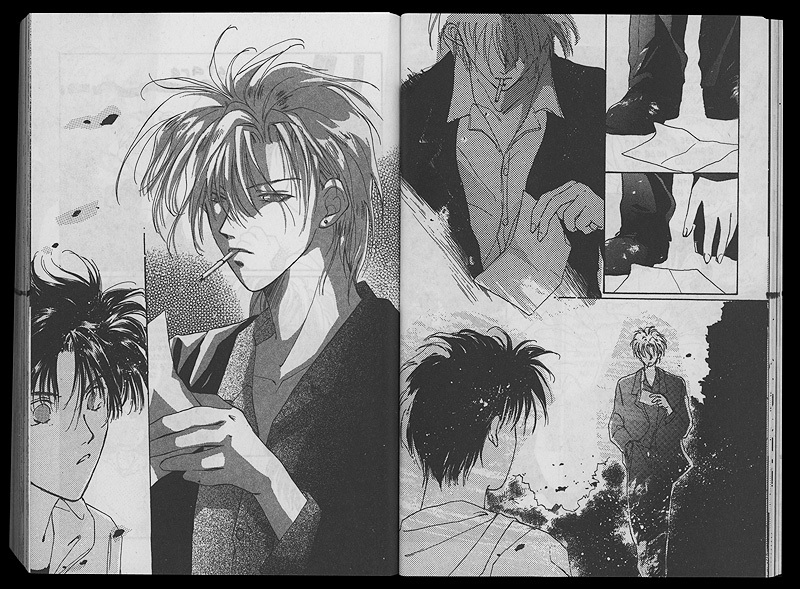 Below: Illustrations from the Gravitation manga. Below: A two page spread from the Gravitation manga (click on the mage to see at full size). Below: The Japanese opening titles for Gravitation. 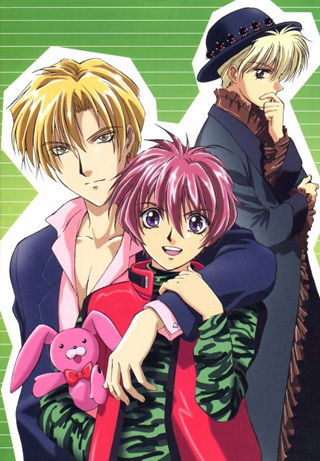 Below: Promotional illustrations for Gravitation.